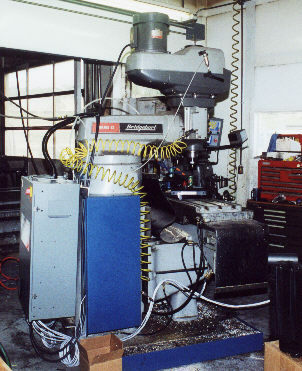 This is a Centroid M400 retrofit to a classic Bridgeport knee mill, completed by CNC Services Northwest in May of 2000. Z axis movement is in the knee. An air assist bladder helps balance the weight of the knee. The servo motor is a 40 in-lb model with a brake to hold the knee when power and air pressure are removed. While a knee Z axis requires this more expensive motor, it does provide greater Z travel and permits full manual use of the quill. The control is wired for 480V service. In these pictures the console is mounted on a 5' arm. 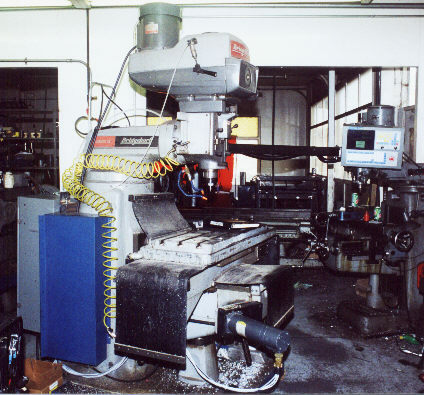 I later replaced this with a shorter 3' arm, making the machine's footprint a little more compact. The electrical cabinet is mounted on the back of the machine column. 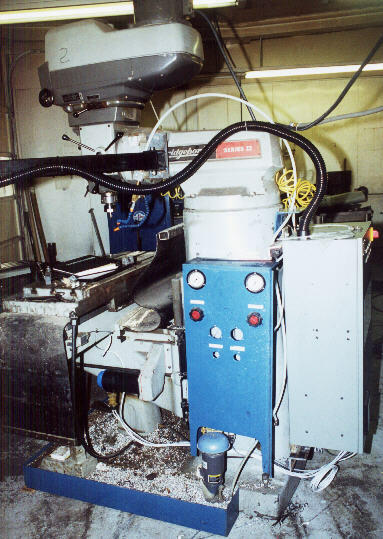 The pneumatic spindle brake is controlled automatically. An existing pneumatics panel on the side of the column was retained. X and Y servo motors bolted up to the existing motor mounts and used the original pulleys. The Z motor required a custom motor mount to accommodate the longer case of the brake-equipped motor.